What does METRO offer start-ups? 25 European Corporate Startup Stars reveals which large companies are doing the most to support new firms. These case studies highlight some specific examples of active and successful collaboration between corporates and start-ups. Why does METRO work with start-ups? METRO works with start-ups in order to foster innovation in the retail, store and consumer electronics spaces. The company aims to create better value for customers by creating solutions that address their needs. How does METRO work with start-ups? 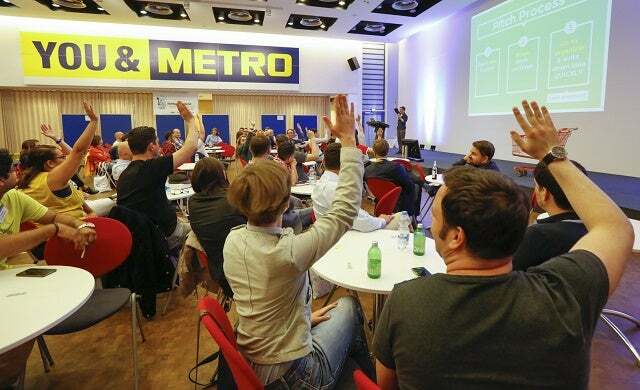 METRO invests in start-ups, organises events that connect start-ups with decision makers, runs the METRO Accelerator programme, and pilots innovative solutions in its stores. Members of the METRO leadership team also carry out voluntary mentoring work for external accelerator programmes, community initiatives and universities. One of METRO’s most publicised engagements is its collaboration with the Berlin startup INFARM, which is piloting growing herbs and vegetables in the METRO Berlin store. Hydroponics enable customers to buy the freshest goods, without pesticides, in a way that avoids transportation costs and helps protect the environment. Most recently METRO invested in orderbird, and acquired a minority stake in Deutsche Technikberatung based in Cologne. Deutsche Technikberatung regards itself as a “technical support for home users” and offers quick support for technical issues through a network of professional advisors. Orderbird is the leading iPad-based point of sale system for restaurants in the DACH region. “With this partnership, orderbird and METRO pursue a common goal: making restaurant businesses more successful with the help of digital solutions,” says Olaf Koch, Chairman of the Management Board of METRO AG. What has METRO done to facilitate collaboration with start-ups? METRO operates and engages with start-ups across 25 regions, and carries out pilots across sales lines. Supporting this work is the business innovation team, which connects innovative start-ups with METRO departments and supports them through a range of projects and initiatives. The business’ global head of innovation scouting and inclusion is also tasked with identifying trends and innovations from around the world and benefits from strong commitment from the top. CEO Olaf Koch is keen to meet business founders and foster the start-up community, and attends all of METRO’s Innovation in Retail meetings. Berlin start-up INFARM was scouted and mentored by METRO and is currently piloting growing herbs and vegetables in the company’s stores. The ‘in-store farming’ concept demonstrates how METRO is creating benefits for customers while conserving resources, as well as using innovation to shape the retail and wholesale industries. What can other corporates learn from METRO about working with start-ups? What is METRO looking for from the start-ups it works with? METRO is looking for start-ups that have a strong team and scalable technologies. The corporation is particularly interested in innovations that enhance customer experience in its stores, create new business models in the areas of hospitality, food technology and consumer electronics, and add value for customers. How can start-ups get involved with METRO? Start-ups that would like their solutions to be considered by METRO, or are looking for later-stage investment should send an email and their pitch deck to jewell.strong-sparks@metro.de. The application process for the METRO Accelerator has closed for 2016, but start-ups should visit the website and signup for the newsletter in order to receive information on the next intake.